Experience the thrill of launching an axe at a wooden target and hitting the bull’s-eye! 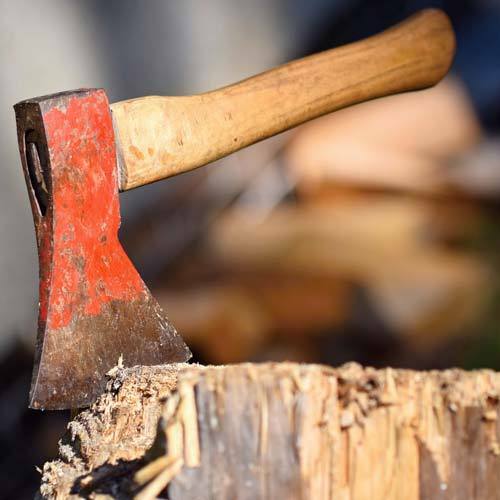 You and your best mates will spend two hours becoming intimate with a 1.5lb piece of whirling wood and metal as you learn, practice, and ultimately play in an axe throwing tournament. Our staff of trained professionals will coach you on how to safely handle and throw a hatchet with accuracy, while giving you tips on how to capture the coveted Bulls-eye! Then you’ll face off against an opposing team in a tournament style game similar to darts…except with axes! Our big screen TVs keep score of the game so you can focus on what’s important – winning! The price per person is $39.99 plus tax/fees for a 2 hour session. Friday and Saturday you must have a group of 8 or more to book. Sunday through Thursday you must have a group of 4 to book. Parties less than 4 please call for availability. All bookings must be made at least 24 hours in advance online. We welcome same day bookings by phone or Walk-ins if there is availability. Note, the maximum occupancy per each double lane is 10. For groups of 11 or more you will need to purchase two double lanes. For parties of 25 or more, please call to discuss group pricing. We will be chop’in a lot of wood together! ALL PARTICIPANTS MUST BE AT LEAST 15 YEARS OF AGE (WITH LEGAL ADULT). Please bring government issued ID and wear CLOSED toe shoes.